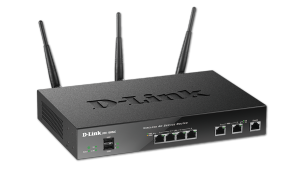 D-Link’s VPN Routers offer high-performance networking solutions to address the growing needs of businesses. 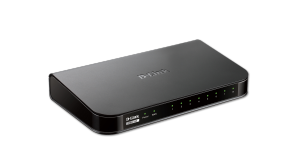 The routers support advanced security features and management features such as IEEE 802.11ac, secure wireless access, 3G WAN redundancy, IPv6 and comprehensive VPN features that can also be integrated easily into your existing infrastructure. These routers empower your mobile workers with remote access anywhere and anytime through the powerful VPN engine to help provide secure connections to company resources. DSR Series VPN routers also support Dynamic Content Filtering – a powerful feature that enables the network administrator to help allow or block access to web sites depending on the category they have been classified into by an automatic classification service. It is available as an optional subscription service. 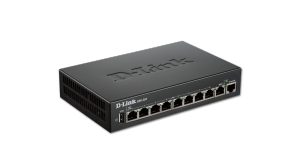 The DSR-150 VPN Router has 8 Fast Ethernet 10/100 LAN ports, 1 Fast Ethernet WAN port, and supports up to 26 VPN tunnels. The DSR-150 also supports Dynamic Content Filtering – a powerful feature that enables the network administrator to allow or block access to web sites depending on the category they have been classified into by an automatic classification service. The DSR-250 VPN Router has 8 Gigabit LAN ports, 1 Gigabit WAN port, and supports up to 65 VPN tunnels. The DSR-250 also supports Dynamic Content Filtering – a powerful feature that enables the network administrator to allow or block access to web sites depending on the category they have been classified into by an automatic classification service. The DSR-500 VPN Router has 4 Gigabit LAN ports, 2 Gigabit WAN port, and supports up to 85 VPN tunnels. The DSR-500 also supports Dynamic Content Filtering – a powerful feature that enables the network administrator to allow or block access to web sites depending on the category they have been classified into by an automatic classification service. 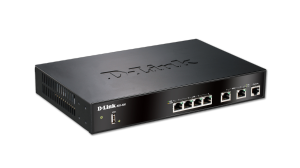 The DSR-1000AC VPN Router has 4 Gigabit LAN ports, 2 Gigabit WAN port, and supports up to 155 VPN tunnels. It also features a 3×3 802.11ac wireless radio. The DSR-1000AC also supports Dynamic Content Filtering – a powerful feature that enables the network administrator to allow or block access to web sites depending on the category they have been classified into by an automatic classification service.